Have you ever wondered what a physics laboratory looks like? They are seldom spacious or organized the way they are shown in movies. 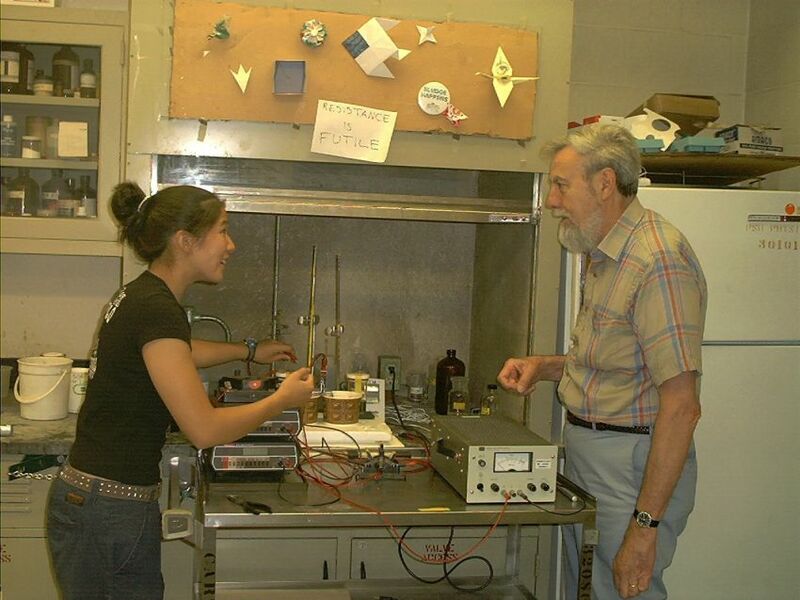 Most LENR researchers work at universities or home laboratories, with tight budgets in a crowded space. 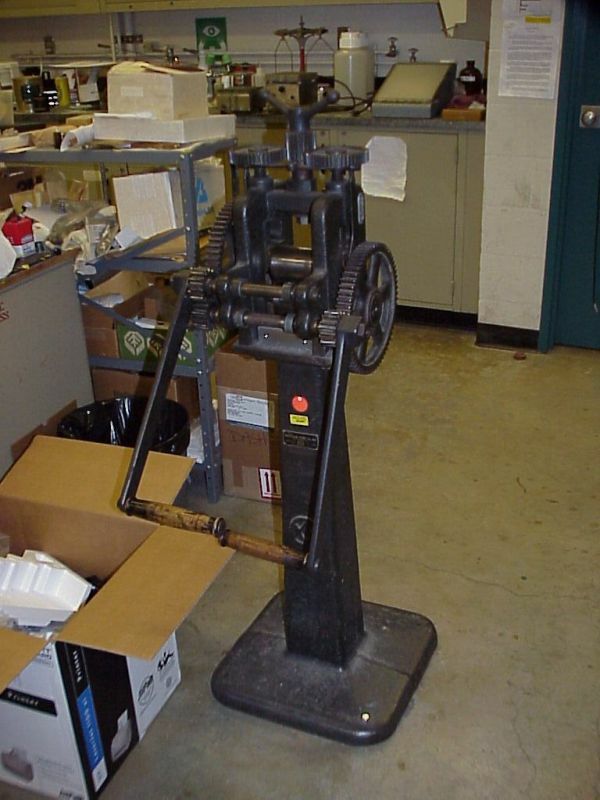 They keep old, broken equipment on shelves to scavenge parts for new experiments. 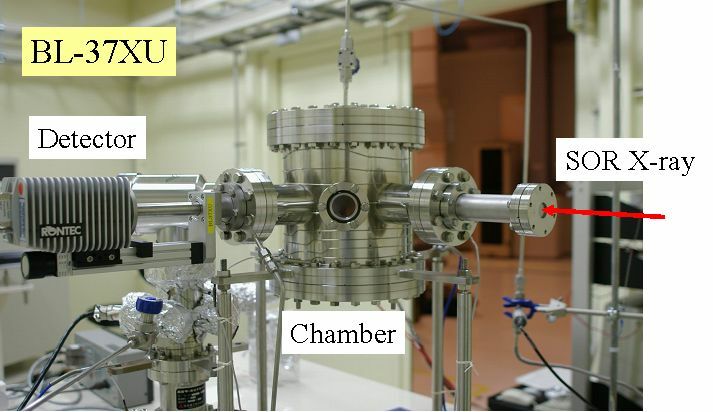 In this section we present some photographs of equipment provided by researchers, and close up pictures of equipment. 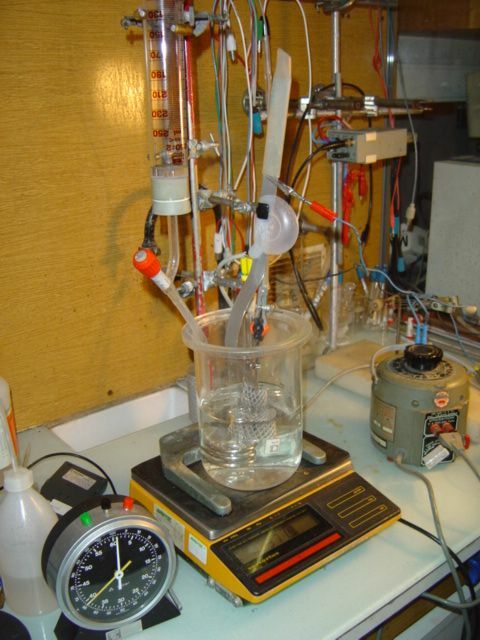 The actual cells, cathodes and other equipment used in electrolysis experiments often have an ad-hoc, homemade appearance, because they are made by hand. They have to be; they are unique, one-of-a kind prototypes. Nothing quite like them has ever been made before. A visitor seeing a LENR experiment the first time may feel disappointed. 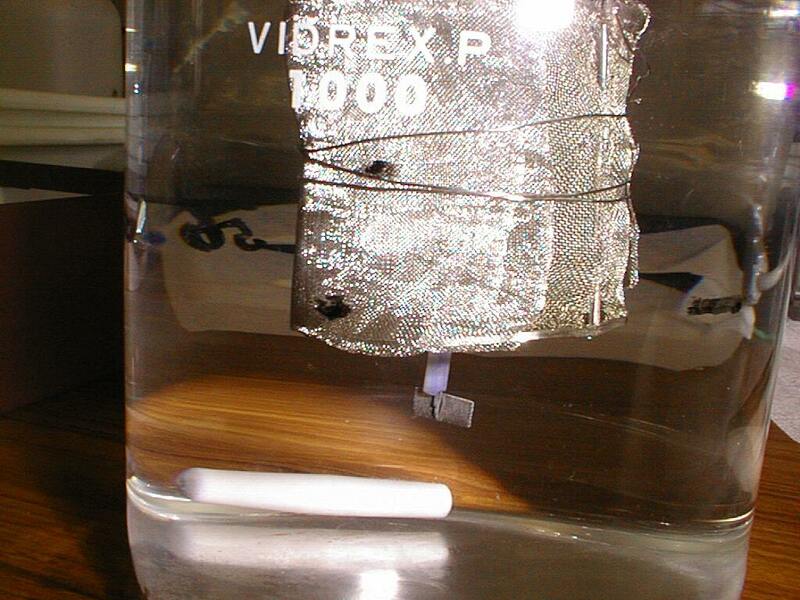 It looks like any other electrochemical experiment. 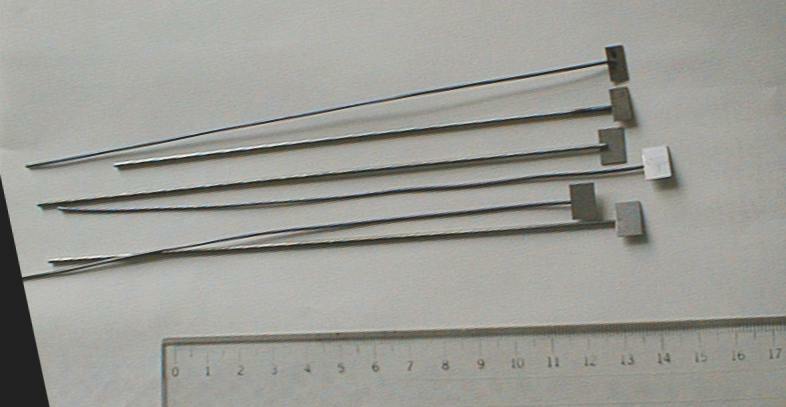 The heat or neutron flux produced by the experiment are so small they can only be detected with sensitive instruments. A null cathode that produces no effect looks exactly like an active cathode. The difference between one cathode and another is in the microscopic structure, or the traces of elements mixed in with the palladium. 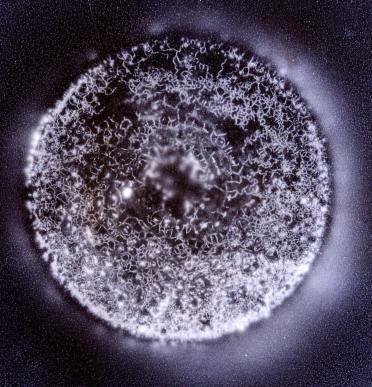 Only one kind of cold fusion looks dramatic; the glow discharge reaction shown below. 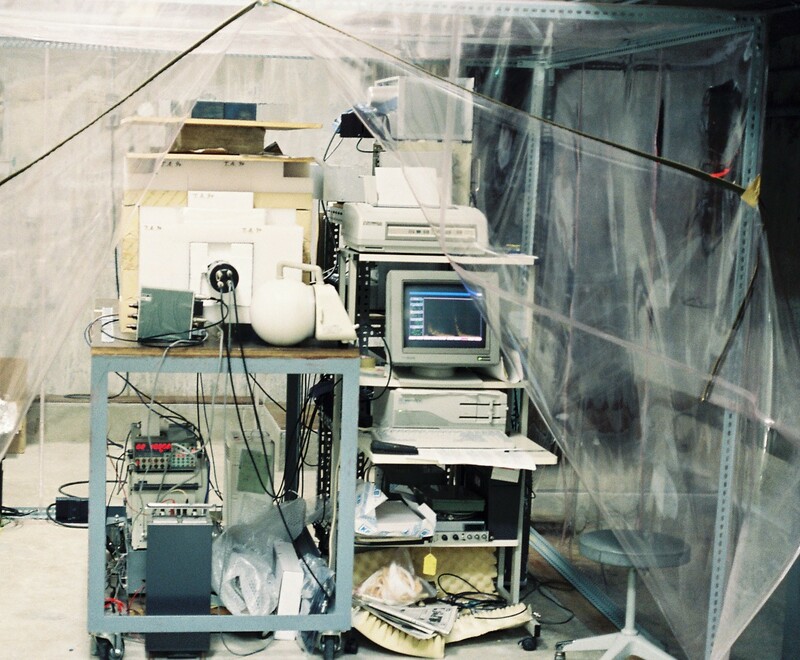 Here are some photographs of cold fusion cells and devices. 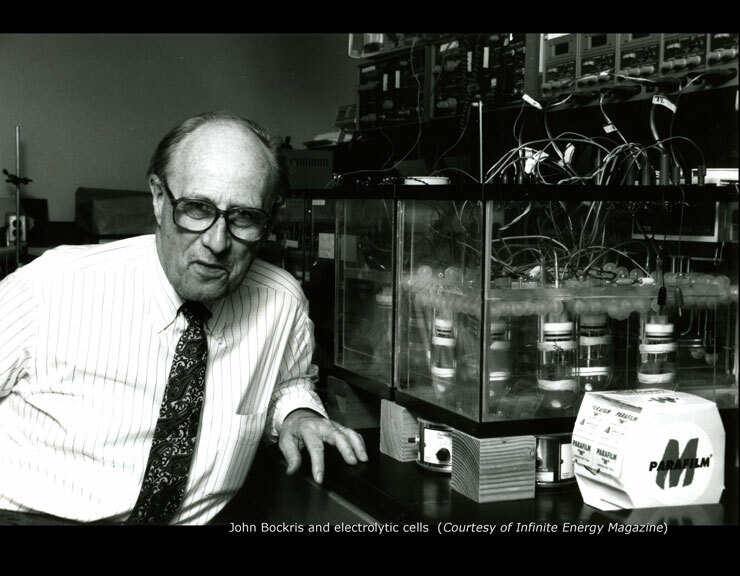 John Bockris and electrolytic cells (Courtesy Infinite Energy Magazine) from the ColdFusionNow 2013 History of Cold Fusion calendar. 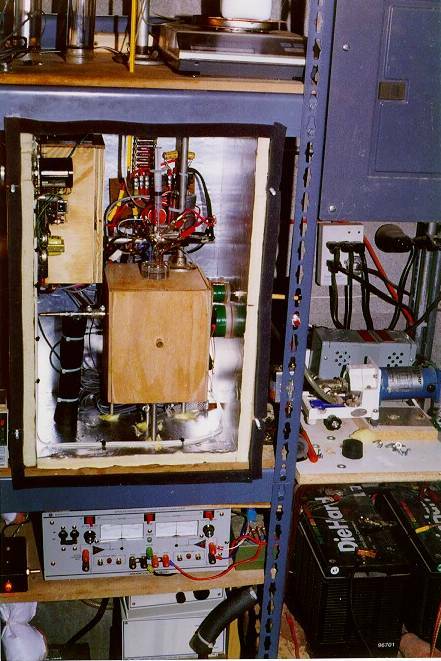 An apparatus for detecting photon radiation (Courtesy Edmund Storms) from the ColdFusionNow 2013 History of Cold Fusion calendar. 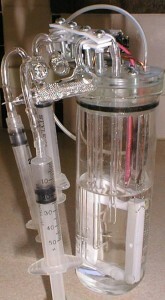 A flow calorimeter constructed by Edmund Storms, courtesy E. Storms. Note the DieHard® battery, lower right, that serves as an uninterruptible power supply. A power failure can ruin an experiment. Whenever possible, inexpensive, ordinary materials and instruments are used. However, experiments are never cheap, and they cannot be done on a shoestring. 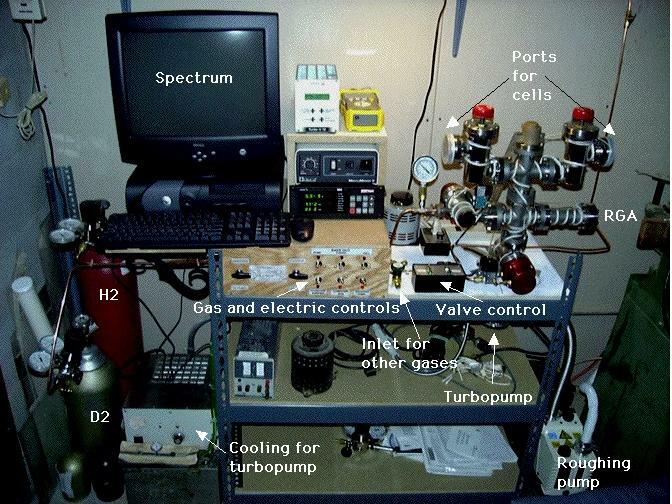 The equipment below, arranged for another experiment, costs about $40,000. 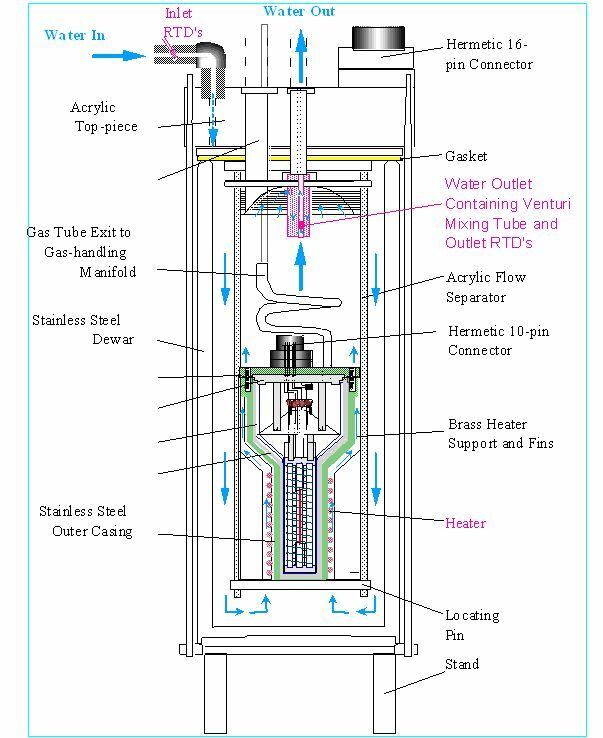 Vacuum system to prepare particles for gas loaded cold fusion cells, courtesy E. Storms. A flow-type cell, courtesy E. Storms. 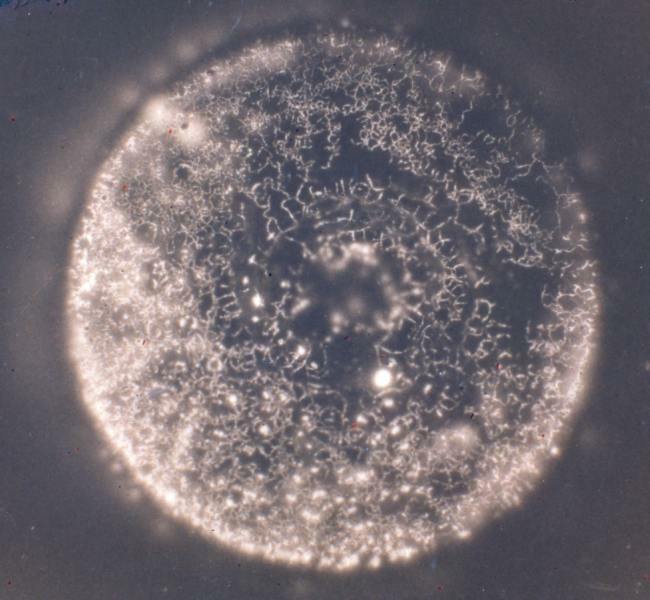 Close up of a Miley-style cell, courtesy E. Storms. Click for larger image. 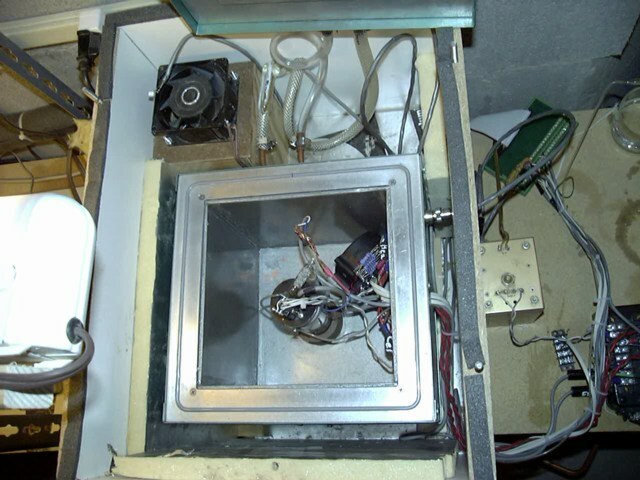 A cell installed inside a Thermonetics Seebeck calorimeter with the lid removed, courtesy E. Storms. 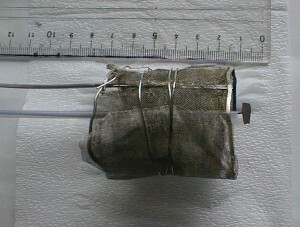 A Seebeck calorimeter made from commercially available thermoelectric converters. Click on images for much larger views. b. Another view, looking down into the calorimeter. 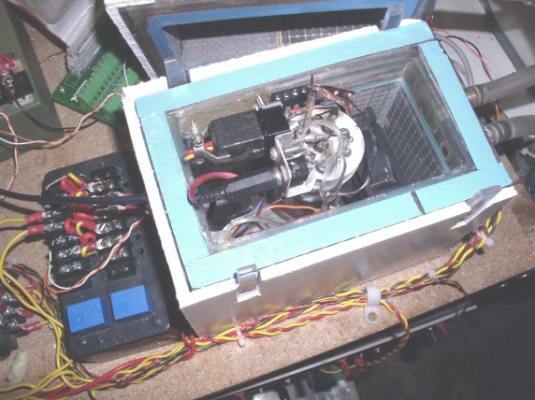 The cell is on the bottom left, the cooling fan is on the right. Photos courtesy E. Storms. 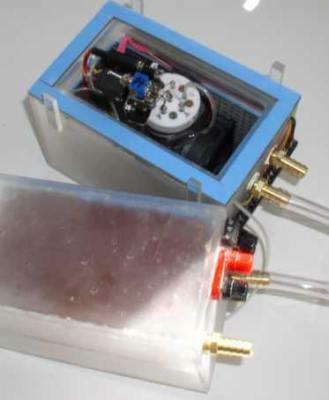 For details, see: Storms, E. Description Of A Sensitive Seebeck Calorimeter Used For Cold Fusion Studies. in The 12th International Conference on Condensed Matter Nuclear Science. 2005. Yokohama, Japan. 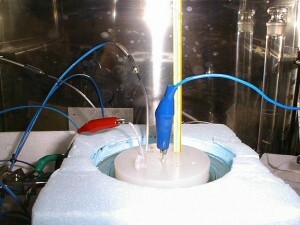 An inexpensive Seebeck calorimeter made from 5-inch PVC tubing. Photo courtesy E. Storms. 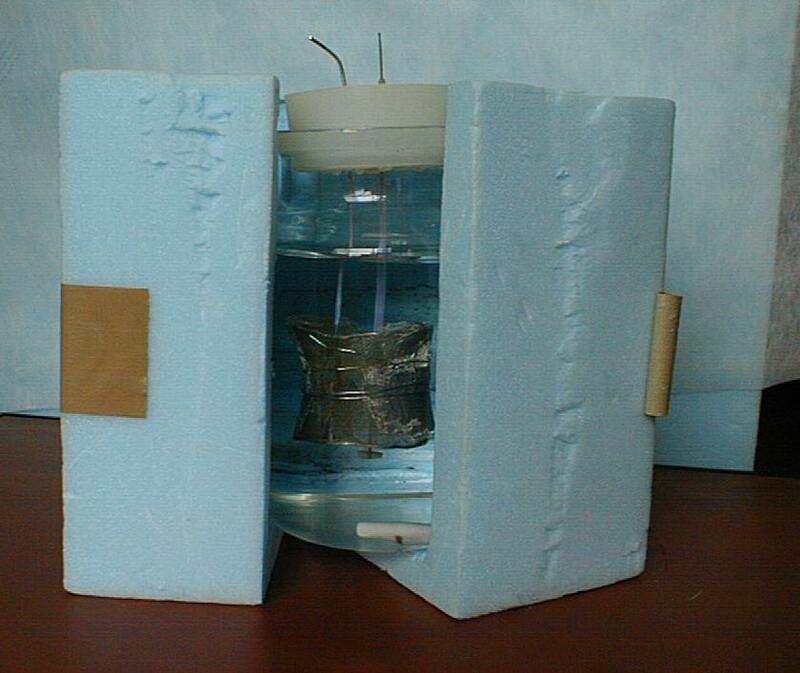 See: Storms, E. How to Make A Cheap and Effective Seebeck Calorimeter. 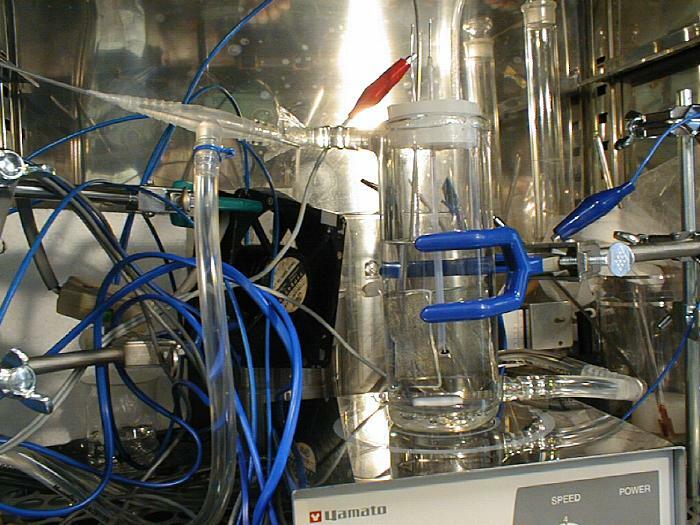 A high resolution mass spectrometer used for on-line helium detection during a cold fusion experiment at C. R. ENEA Frascati. (http://www.frascati.enea.it/nhe/). Click to enlarge. A cell at ENEA Frascati. SRI Micro-Mass 5400 Noble Gas Mass Spectrometer for cold fusion experiments at SRI, International. See: McKubre, M.C.H. Review of experimental measurments involving dd reactions, PowerPoint slides. 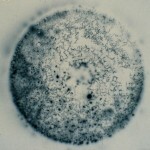 A cell at SRI, from the same set of slides. 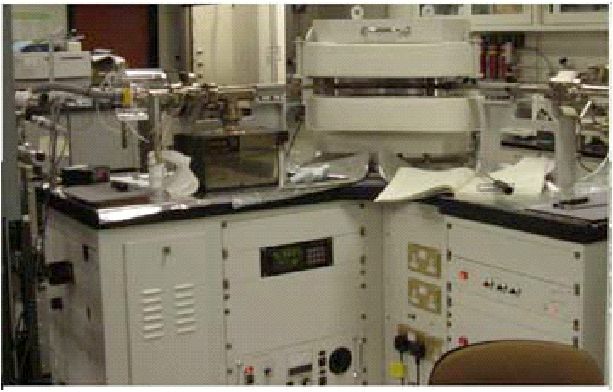 Experimental device used to perform D2 gas permeation through Pd complexes, and to perform in situ elemental analyses of the given elements by evacuating the D2 chamber and using the built in X-Ray Photoemission Spectroscopy (XPS) unit. See: Iwamura, Y. Observation of Nuclear Transmutation Reactions induced by D2 Gas Permeation through Pd Complexes. in Eleventh International Conference on Condensed Matter Nuclear Science. 2004. Marseille, France, PowerPoint slides and paper. 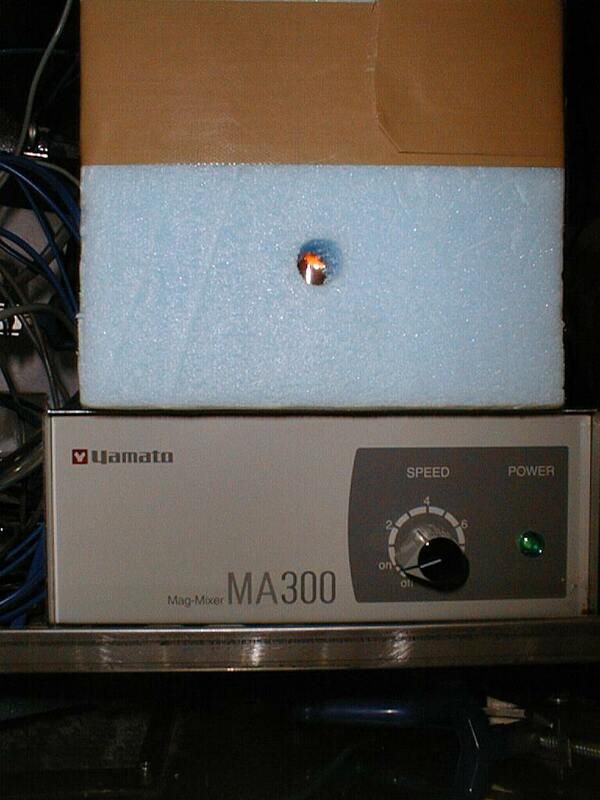 A glow discharge electrochemical cell at Hokkaido University, courtesy T. Mizuno. 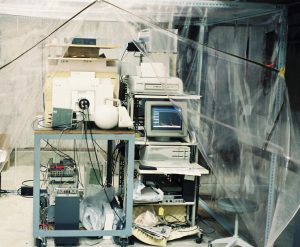 This cell is installed inside a crowded constant temperature air-cooled chamber. It placed on a magnetic mixer. Cooling water is pumped through the plastic tubes attached to the top and bottom. The muffin fan at the back circulates the air in the chamber. A schematic of the calorimeter shown above. 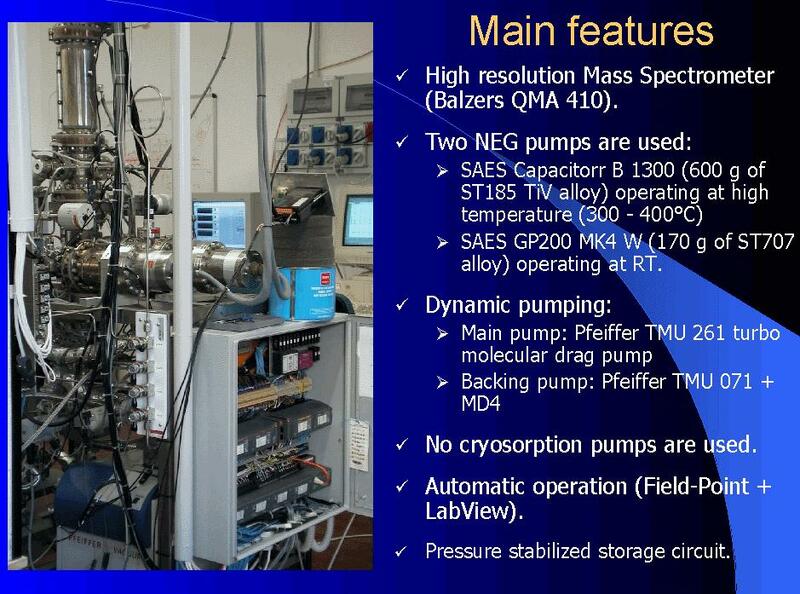 Cold fusion neutron energy analysis system, courtesy T. Mizuno. Click on image to enlarge. 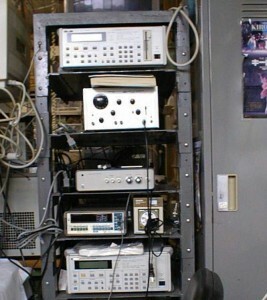 A cold fusion neutron energy analysis system used by Mizuno and Akimoto in 1989, in the underground laboratory at Hokkaido National University. The round object at the center of the plastic blocks in the middle of the picture is a photo multiplier. 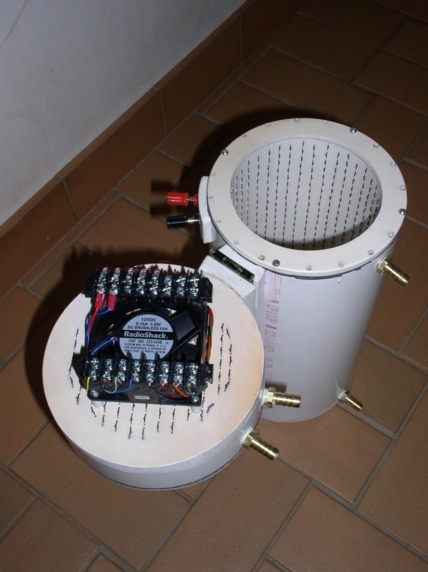 Inside the white bricks, the Ne-213 liquid scintillator is placed in front of the photo multiplier, and the cell is placed in front of the scintillator. 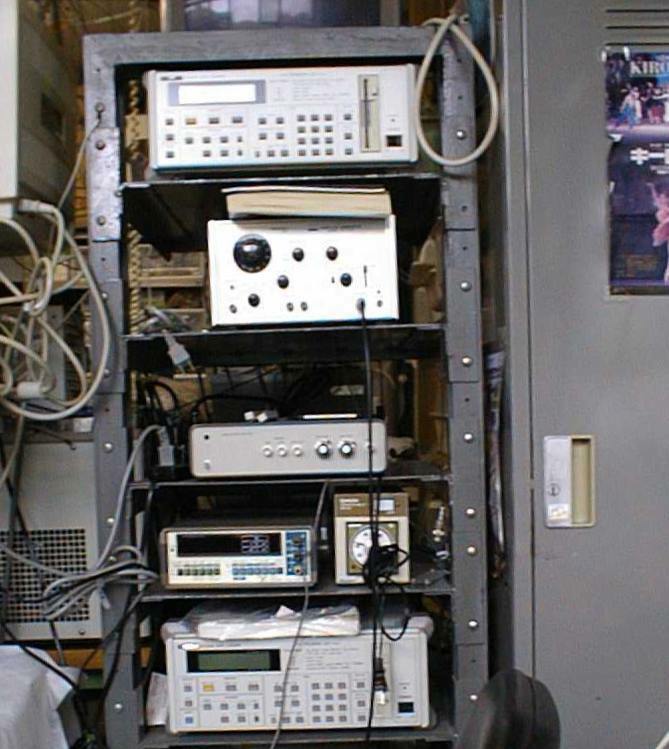 The computer and energy analysis instruments are on the right. From Mizuno’s book Nuclear Transmutation: The Reality of Cold Fusion. The three phases of glow discharge. Excess heat is only observed in the third, hottest phase. Click to enlarge. Anode-cathode in cell. 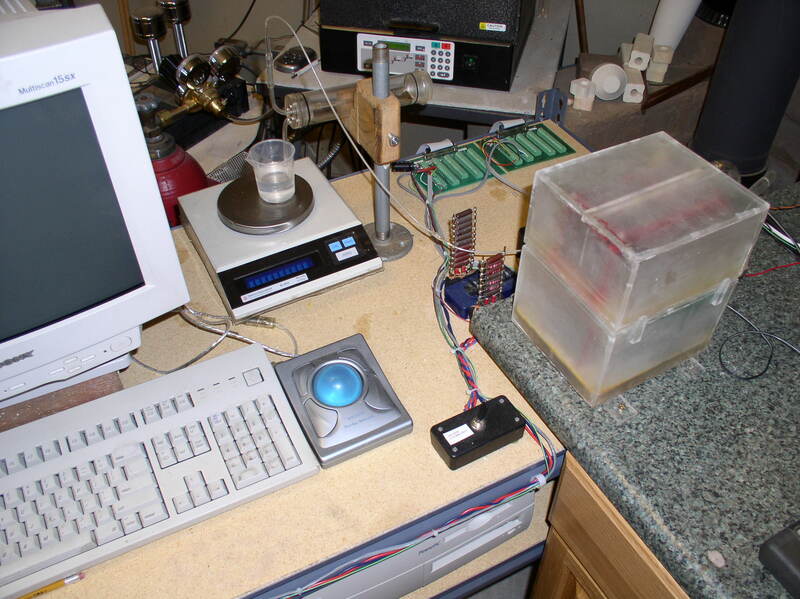 White object is magnetic stirrer. 1200 dpi scan of Ohmori’s unused cathode. The surface is roughened with quartz glass. Cold fusion experiments can be dangerous. 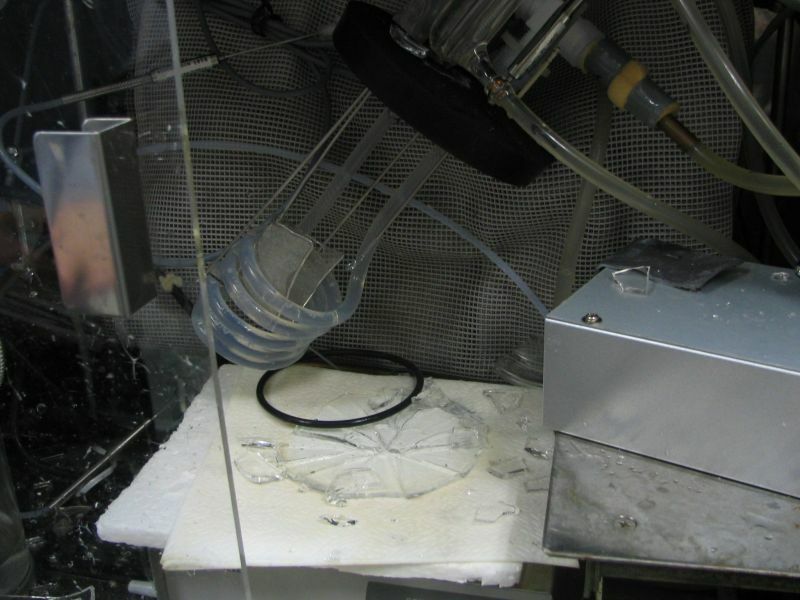 Here are the remains of a glow discharge cell that exploded in Mizuno’s laboratory in January, 2005. Mizuno initially thought this caused by recombination, but that is ruled out because the event produced roughly 441 times more energy than the total input energy. For details and more illustrations of this accident, see: Mizuno, T. and Y. Toriyabe. Anomalous energy generation during conventional electrolysis. in The 12th International Conference on Condensed Matter Nuclear Science. 2005. Yokohama, Japan. Photo courtesy T. Mizuno. In September 2004, J-P. Biberian (Université d’Aix-Marseille II) reported that a cell with a palladium tube cathode exploded. The cell had no more than 120 ml of gas, which does not seem like enough to cause a chemical explosion of this magnitude. Photo courtesy J-P. Biberian. See Biberian, J.P., Unexplained Explosion During an Electrolysis Experiment in an Open Cell Mass Flow Calorimeter. J. Condensed Matter Nucl. Sci., 2009. 2. In 2018, Biberian reanalyzed the event, and he now thinks it may have been a chemical recombination explosion. 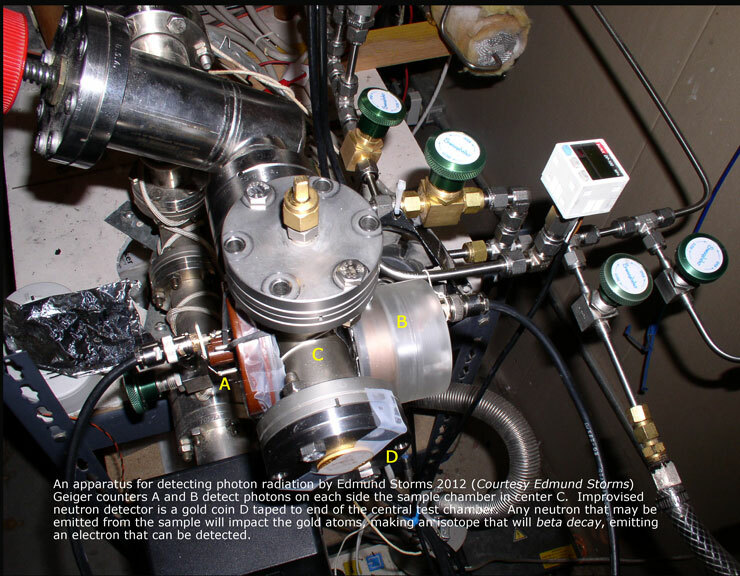 See: Reanalysis of an Explosion in a LENR Experiment. 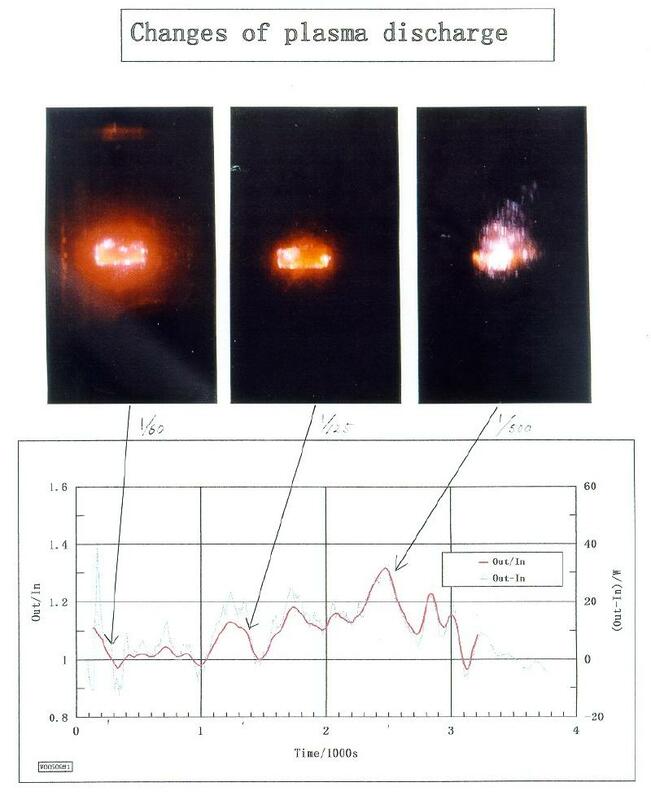 There have been at least four anomalous cold fusion cell explosions. See chapter 12 of the e-book Cold Fusion and the Future, and Zhang, X., et al. On the Explosion in a Deuterium/Palladium Electrolytic System. in Third International Conference on Cold Fusion, “Frontiers of Cold Fusion”. 1992. Nagoya Japan: Universal Academy Press, Inc., Tokyo, Japan. 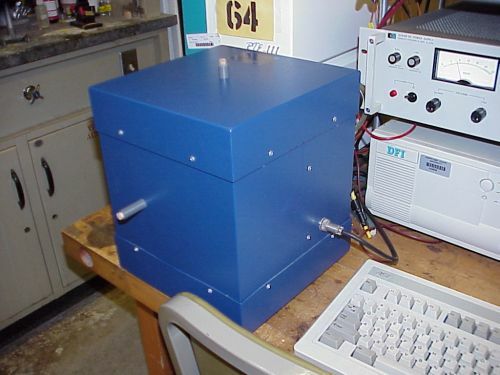 A glow discharge experimental setup. A glow discharge experimental setup, similar to the ones described by Ohmori and Mizuno (above). Courtesy P. Clauzon. See: Fauvarque, J., P. Clauzon, and G. Lalleve, Abnormal excess heat observed during Mizuno-type experiments. 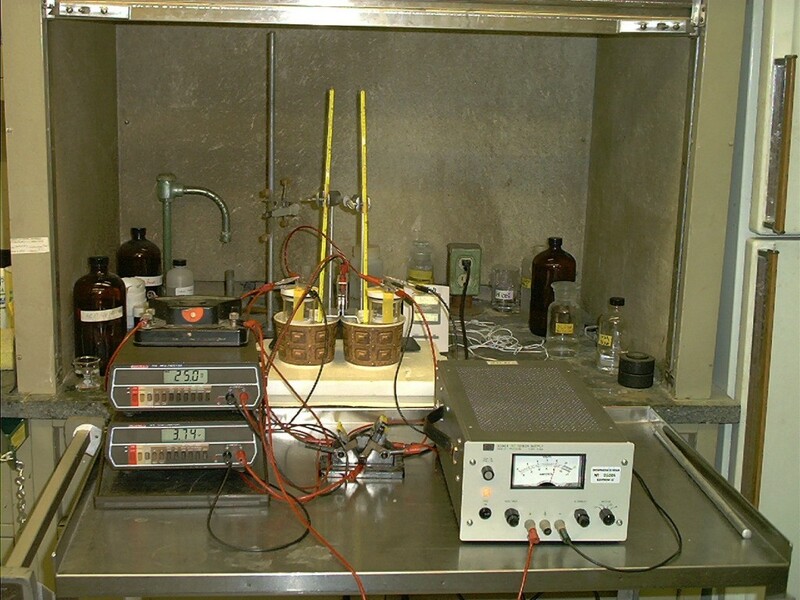 2005, Laboratoire d’Electrochimie Industrielle, Conservatoire National des Arts et Métiers: Paris. 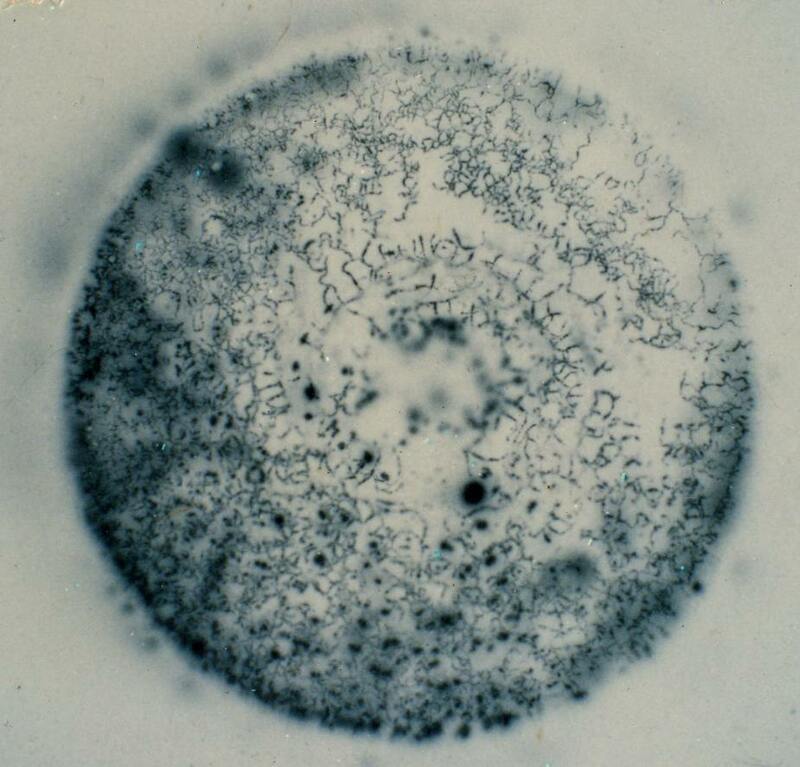 A Polaroid autoradiograph from M. Srinivasan, Neutron Physics Division (ret. ), Bhabha Atomic Research Centre, Bombay, India. The image shows x-rays from tritium generated in a Ti disk with a plasma focus device using deuterium gas loading. The Polaroid paper is 12 cm × 9 cm. 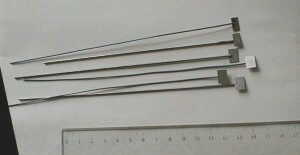 The disk diameter is 6.7 cm. This image is 200 dpi. Click on this image for a larger, positive 300 dpi copy. 1. 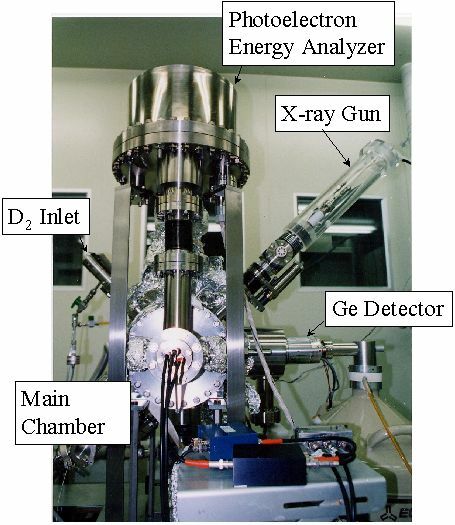 Rout, R.K., M. Srinivasan, and A. Shyam, Autoradiography of Deuterated Ti and Pd Targets for Spatially Resolved Detection of Tritium Produced by Cold Fusion, in BARC Studies in Cold Fusion, P.K. Iyengar and M. Srinivasan, Editors. 1989, Atomic Energy Commission: Bombay. p. B 3. 2. Rout, R.K., et al., Detection of high tritium activity on the central titanium electrode of a plasma focus device. Fusion Technol., 1991. 19: p. 391. 3. Rout, R.K., et al., Reproducible, anomalous emissions from palladium deuteride/hydride. Fusion Technol., 1996. 30: p. 273. 4. Iyengar, P.K. and M. Srinivasan. Overview of BARC Studies in Cold Fusion. in The First Annual Conference on Cold Fusion. 1990. University of Utah Research Park, Salt Lake City, Utah: National Cold Fusion Institute. 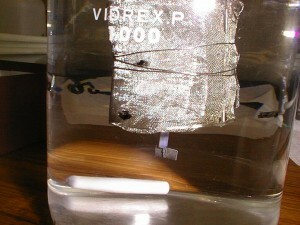 During the ICCF-10 conference (August 24 – 29, 2003) this experiment was set up in a laboratory at MIT, where the excess heat effects were demonstrated to over a hundred ICCF-10 participants. See more photos in our Special Collection, ICCF10. Here are PowerPoint slides from the Summer 2002 session and the Summer 2003 session. Photographs by Dan Chicea, provided courtesy B. Zimmerman. Corissa Lee setting up the experiment. Click to enlarge. 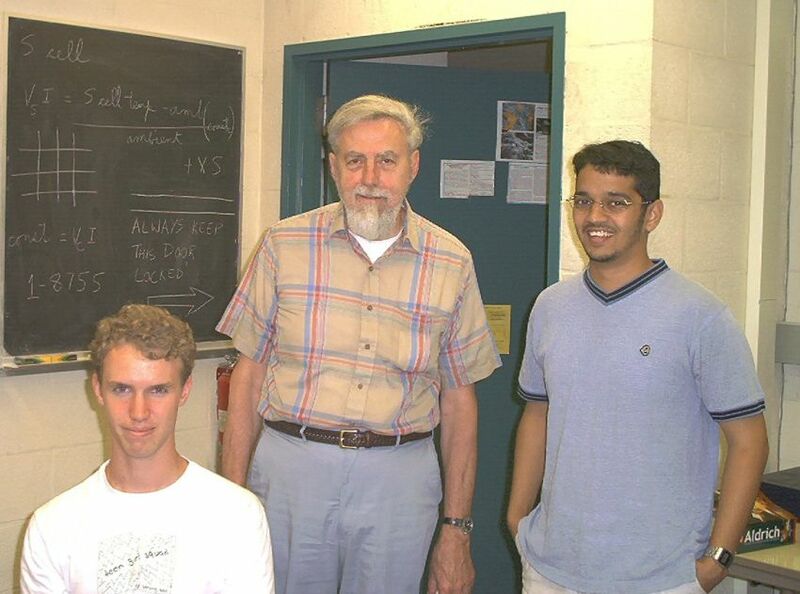 From right, Abhay Ambadkar, a graduate student, Dr. Dash, and Ben Zimmerman. Click to enlarge. 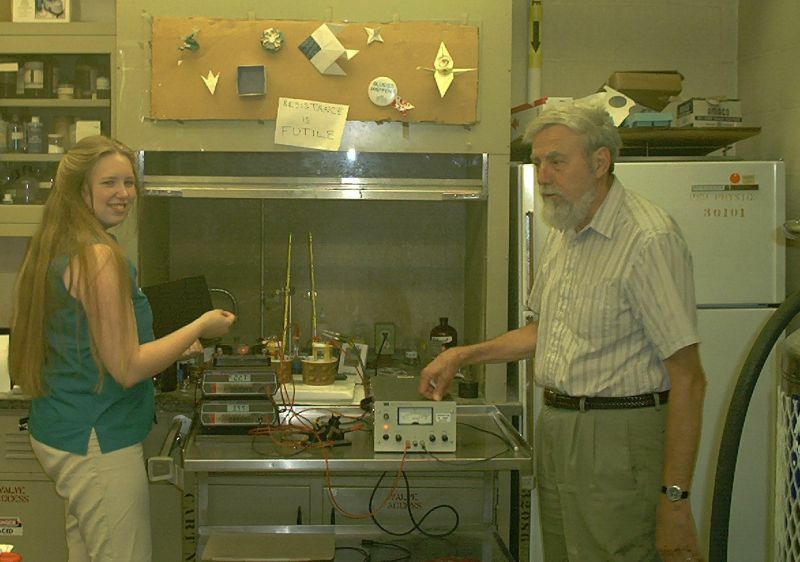 Corissa Lee and John Dash taking a voltage and temperature reading. Click to enlarge. Experimental setup, with the power supply and multimeter in the foreground and cells with thermometers in the fume hood. Click to enlarge. Corissa Lee and Abhay Ambadkar using the SEM (scanning electron microscope) to check for transmutation. Click to enlarge. Shelsea Pedersen and John Dash going over some data. Click to enlarge. 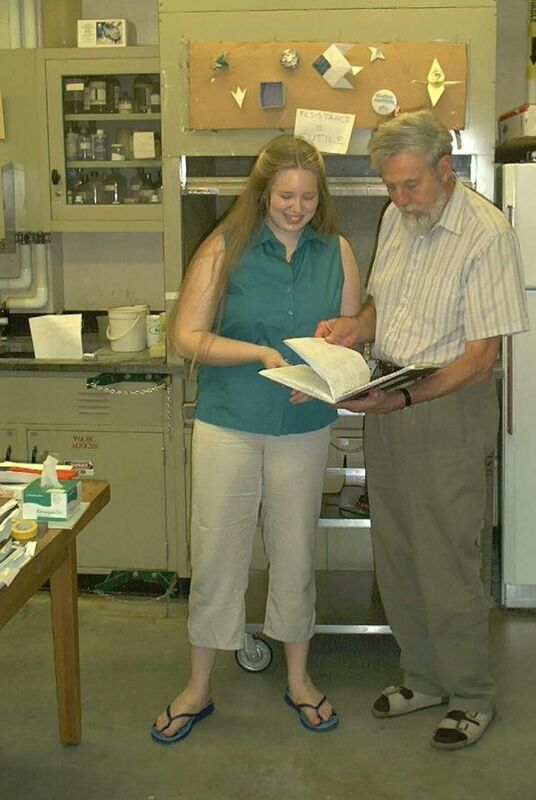 Shelsea Pedersen and John Dash posing with the experiment. Click to enlarge. 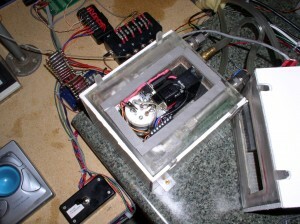 The experiment shown above is rudimentary. 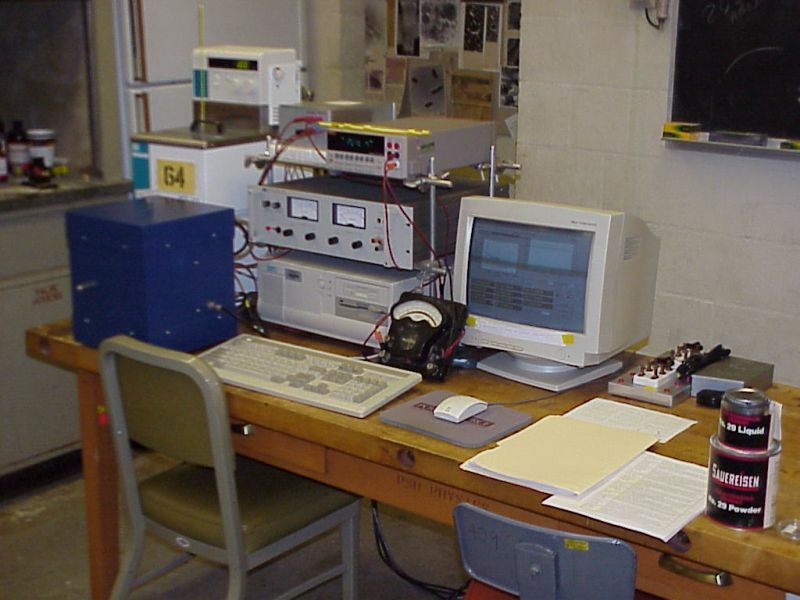 Dash and his students have also demonstrated excess heat with precision instruments, such as the Thermonetics Seebeck calorimeter shown here. A close-up of the Seebeck calorimeter. Click to enlarge. 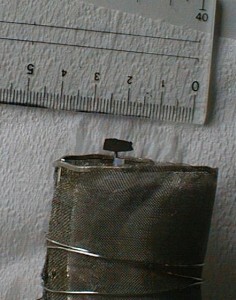 A large cold roller sometimes used to prepare titanium samples at Portland State. 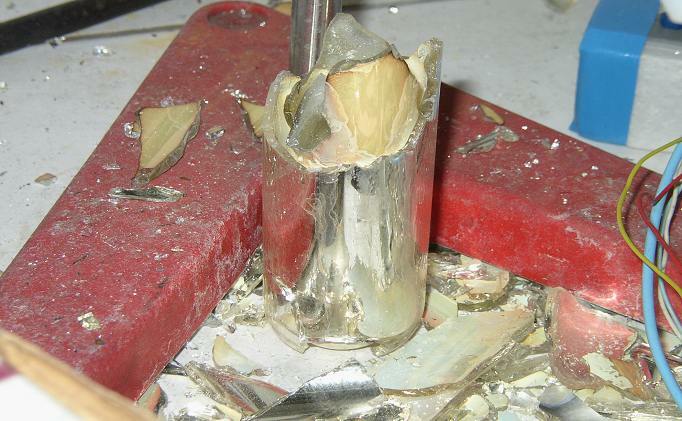 Most of the tools of cold fusion research are delicate, but sometimes you need a bigger hammer. Click to enlarge. The paper is: Warner, J., J. Dash, and S. Frantz. ELECTROLYSIS OF D2O WITH TITANIUM CATHODES: ENHANCEMENT OF EXCESS HEAT AND FURTHER EVIDENCE OF POSSIBLE TRANSMUTATION. in ICCF9, Ninth International Conference on Cold Fusion. 2002. Beijing, China: Tsinghua University.